Inder Loves Folk Art: Playing with crayons at Zza's Trattoria on Grand Ave. 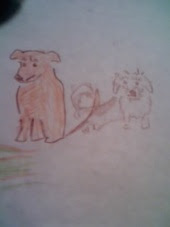 Playing with crayons at Zza's Trattoria on Grand Ave.
My take on Omie and Crouton, using stubby crayons on the paper tablecloth. As Steve always says (about himself, but it applies much more to me), "I do not render well." Still, who says they put those crayons out just for the kids? Sorry for the bad photo (taken with my crummy cell phone).